If you believe that simple ingredients and recipes are the best, then this is for you! 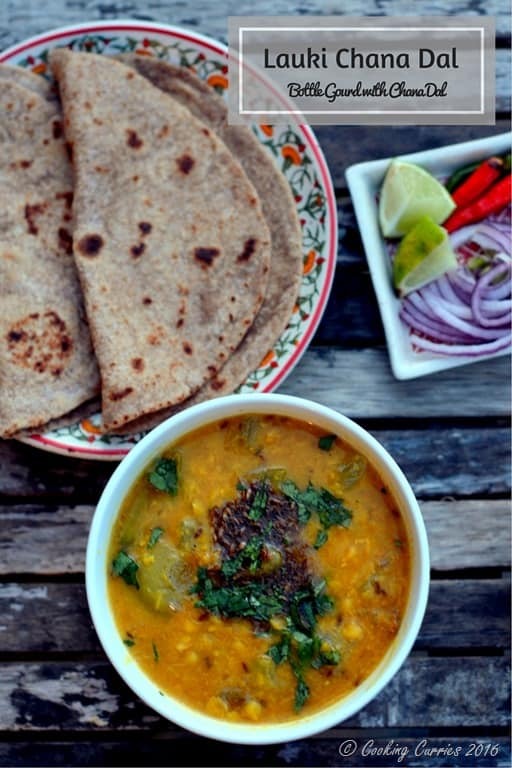 The inherent flavors of lauki / bottle gourd and the chana dal stands out in this Lauki Chana Dal with all the other spices playing the role of extras, just enhancing the flavor when needed but not overpowering the stars of this dish. Growing up in Southern India, dal was always an additional ingredient to form the base of the curry in sambar and rasam. It was rarely the hero of the dish. Even when you go out to restaurants, with the Norhtern Indian fare as their focus, we never ordered the dal. Why would you go spend at a restaurant to eat the measly dal when you had the other power house heroes like the paneer or cauliflower or bhindi or in the case of meat-eaters – chicken and mutton! It just did not make sense then. Then slowly and deliberately, I started ordering some of these dal / lentil dishes to see how they tasted. I mean, they had to be on the menu in most restaurants for a reason, right. While it was not a Lauki Chana Dal on the menu, the menu usually had a dal fry or a dal makhani or a rajma masala. I was taken aback by the burst of flavors that such a simple ingredient could bring in a dish. I loved them so much that I wanted to make them at home. This was when I was in my teens and I was allowed to cook on my own, if there was an adult present in the house. It was right around this time that I bought my very first cookbook. Not all the ingredients were readily available in the small town in Kerala where we lived. But I made do with whatever I could get my hands on. And thus, I entered the world of my current favorite protein powerhouse ingredient, dal. Cookbooks and TV shows were pretty much my only sources back then, but I cooked and cooked and loved all the different varieties of things I could make with these simple lentils. 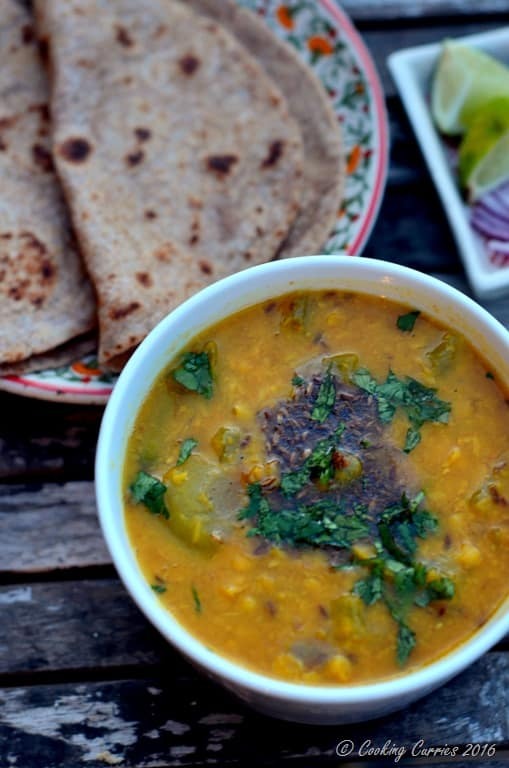 This Lauki Chana Dal recipe is one of my all time favorites. 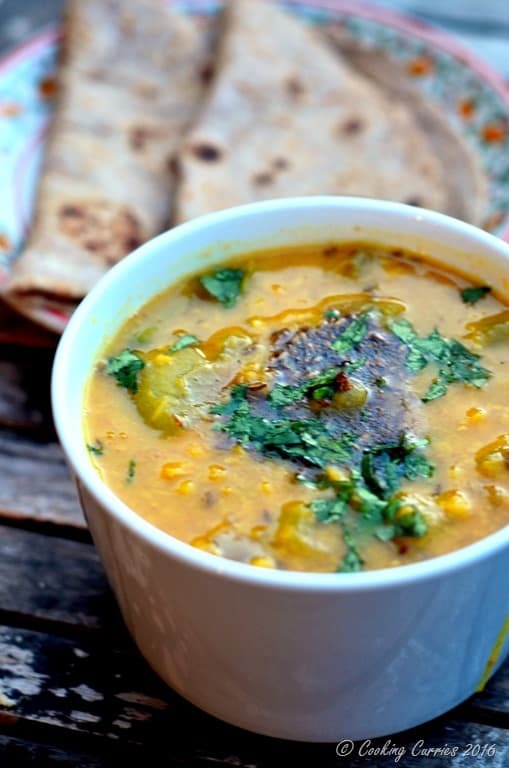 Though, this is not necessarily something you make when are throwing a party or something like that, it serves it purpose for a quick weeknight dinner of dal and rotis or when you have sudden company. I hope you love this recipe as much as I do! Wash the chana dal in cold water a few times and pressure cook it with about 3 cups of water till soft. Or if cooking on stove top, cook with about 3-4 cups of water till it becomes soft, which may take about 30-40 mins. Remember to keep the heat on medium and check often or it may boil over. Once the chana dal is cooked, add the lauki along with turmeric powder, ginger and chillies and cook again till the lauki is soft. It won’t take a long time, maybe 10 mins or so. Add salt to taste. In a small sauce pan / kadhai , heat the oil, add the cumin seeds, asafetida, cayenne and coriander powder. Once the cumin seeds start sizzling, pour them all onto the lauki-dal mixture. Squeeze the lemon juice and garnish with cilantro. Serve hot with rotis or rice! 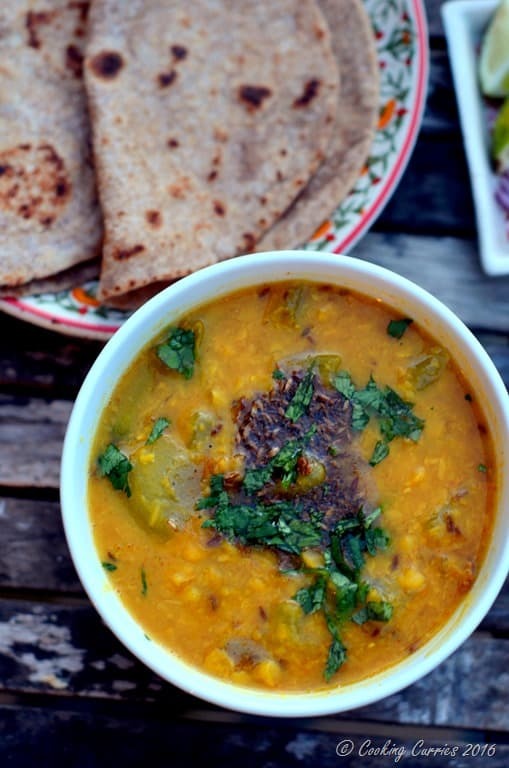 A simple dal recipe with Lauki and Chana Dal! In a small sauce pan, heat the oil, add the cumin seeds, asafetida, cayenne and coriander powder. Once the cumin seeds start sizzling, pour them all onto the lauki-dal mixture. Squeeze the lemon juice and garnish with cilantro. Serve hot with rotis or rice! This recipe is adapted from Sanjeev Kapoor’s How To Cook Indian. Check out my store http://www.cookingcurries.com/store/ to see more of my favorite cookbooks! A beautiful curry and combination of spices! It sounds amazing! I love dal and definitely eat it as the star of the show! Yum! This dal looks better than in a restaurant! I love dal and it was interesting to see what spices you used in yours, definitely a few extra to what I put in it. Our favourite is a spinach and coconut dal I make nearly every week. I love dal and this version sounds delicious! It’s so easy to make too! What a pretty dish! I love the flavor combo you have in here too. All that spiciness with a twist of lemon and cilantro? YUM! This looks and sounds delicious! I love the vibrant color and the combination of spices. Anything with ginger has my vote! I could seriously eat Dal every day! Love the spices and all those flavors. Love chana dal! Your version with the gourd sounds wonderful!